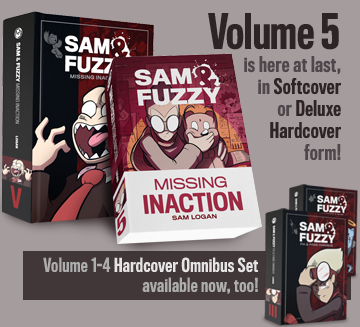 I've completed my little holiday revision of the Sam and Fuzzy shop today by revamping the Commissions section. As you can see, I'm now selling signed prints as well as original art. If you've got a favourite Sam and Fuzzy strip or picture from the gallery, now you can get yourself a keen high res copy. Did you see Jeffery Rowland's 24 hour comic yet? It's pretty keen! And it looks like John A is going to be doing one as well. Scott McCloud came up with the idea way back when, and it's a pretty cool one... maybe I will attempt to draw one myself some day. I finally got myself a copy of the new Zebrahead CD, and it is every bit as awesome as I thought it would be. I also picked up the debut album from Jet. I know they're not particularly innovative or whatever, but what can I say? I love this stuff. 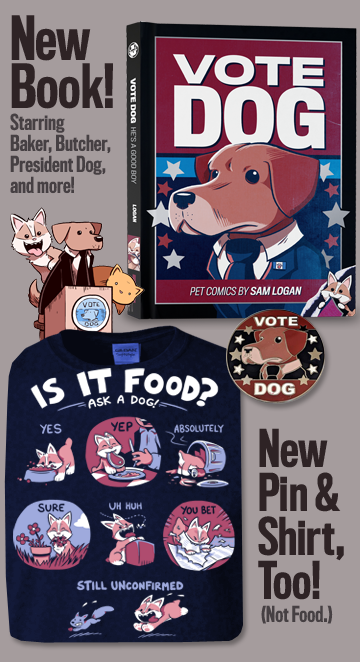 Because some of you have been asking, I have made a wider assortment of Sam and Fuzzy Clothing available! In the shop, you will now find Hoodies, XXL and XXXL t-shirts and Babydoll Ts. These suckers are a limited time offer -- after December 2nd, they will no longer be available. So if you want one, or want to buy one for someone else as a Christmas present... act fast! Today's update was delayed a couple of hours while I was busy putting the finishing touches on the new section of the shop for the first ever Sam and Fuzzy Christmas Cards! Basically, it took about a million hours longer than I though it would... whoops. But yes... Sam and Fuzzy Christmas Cards! I thought this would be a neat idea since I've never seen any other webcomics attempt to hock a similar product. Please help me feel like I didn't stay up until 3:30 AM for nothing and go take a look at them (and maybe buy some.) I know it's still kind of early for most people to be thinking about Christmas, but I want people to be able to get them early enough to actually make use of them!